Now I wan na say Aquaman #3 has improved the series, but it didn’t. Sure there are improvements in there somewhere that I will talk about, but the series so far hasn’t impressed me the way I know it can. Let’s start with the positives. 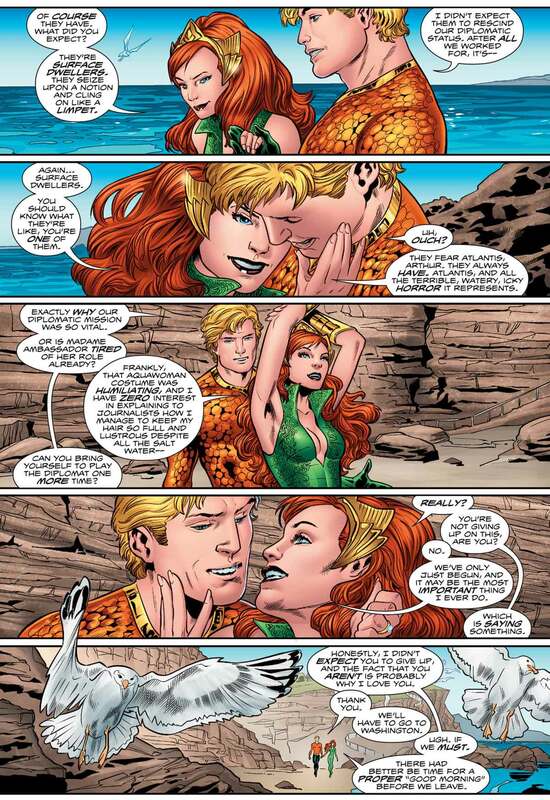 Aquaman and Mera finally speak to each other like a married couple and not a king to servant. The art is really starting to grow on me a little more as it suits the aquatic nature. Just like in the cover Arthur and Mera are going to the White House which is executed fairly well. Now the negatives, The issue doesn’t have much action, but it does have a lot of talking. It’s a nice change of pace, but the ramifications of the last issue aren’t really present until later on and it’s not even from the problem of the last issue. Some of the characters from the previous issues are missing here which was weird because they were introduced nicely. I realized Dan has problems with starting a comic book in an exciting way which does create a disinterest at first. The story moves forward in Aquaman #3 and although it doesn’t massively improve my thoughts on the series it does make some improvements. The dialogue within the issue is much stronger between our main characters, but the other fun characters are gone. Dan Abnett has yet to impress me with the character that Aquaman truly is.